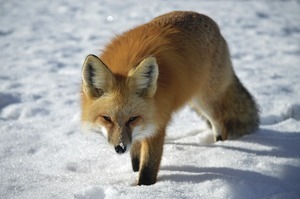 This spring, Steamboat Magazine hosted our first-ever wildlife photo contest. 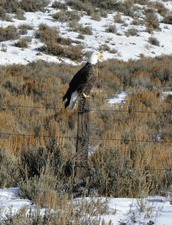 Submissions ranged from back yard to backcountry sightings, and voting happened online at www.steamboatmagazine.com. Our partners, Jensen Photography and Home on the Range, offered great prizes for the audience-award-winning shots that are showcased here in Genuine Steamboat, along with some other stellar wildlife photo submissions and the great back stories behind the shots. our encounter that day,” he says. 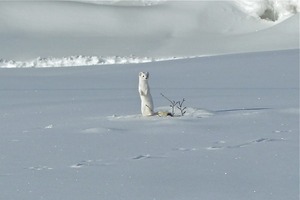 Dave Brotherton had seen this ermine several times on the ridge behind McDonald’s. He caught this shot while snowshoeing on a particularly cold winter day. “I really liked that it caught the sparkles in the snow,” he says. 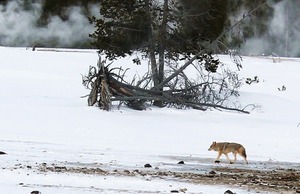 Chrys Marty photographed this coyote in March, near the sulphur pools at Yellowstone National Park. “He/She was was just strolling along in no particular rush,” she says. 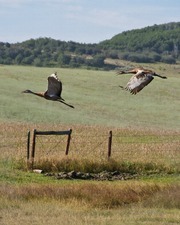 Daniel Hebard lives near a nesting ground for the Greater sandhill cranes in the Elk River Valley. He shares his experience photographing one of the largest birds in North America: “Being migratory, they begin flying south in September for their winter homes and return annually in April as the winter snows leave the meadows around Elk Mountain, where we are entertained with their courtship rituals from a moderate distance. 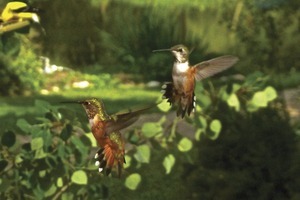 I am often able to capture an image with a mating pair standing on the ground while feeding or dancing in the spring. Ray Heid shares his personal story about how he came to photographing grouse: “In 1992, when I was the president of the Colorado Outfitters Association, I went to a National Outfitters meeting in Twin Falls, Idaho. One morning, we went with a guide to watch the sharp-tailed grouse dance on a lek. 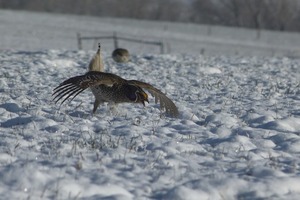 It was one of the last remaining Columbian sharp-tailed grouse leks in Idaho. He showed us two leks – and one was in the middle of a road that had just been built. He told us that the Columbian sharp-tailed grouse will come to the same area every spring, within 100 feet, for years, and that if you build a road there, they will dance in the road. 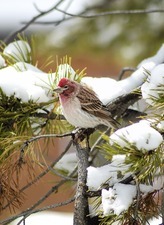 “Last spring, I was out cross country skiing at the back of our ranch when a flock of Columbian sharp-tailed grouse flew in and landed just in front of me. I remembered those words, ‘they come back to the same area for years.’ I started going out every morning before daylight, and sure enough, they were there every day in March, April, May and early June. 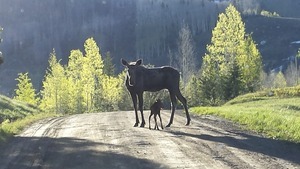 Peter VanDerWerf captured this mother and baby moose at the Vagabond saddle while driving up to work at the Four Points Lodge construction site on the Steamboat Ski Area last summer. It was a Sunday morning and these two walked right in front of his truck. He also was able to get some video of the newborn moose calf stumbling on its new legs, as the mama nudged it back up with her long snout. “I don't think this baby moose is more than a few hours old,” he says. Josh Cook captured this Great-horned owl last fall in a Dry Creek Park in Hayden. 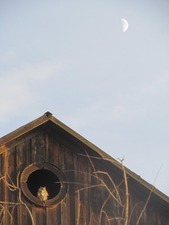 “I was taking my evening walk and noticed the owl. 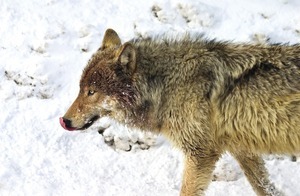 I returned the following evening and got the photo,” he says.